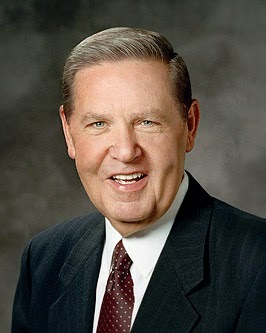 "One of the challenges of the faithful is to realize that sometimes those who are not obedient and worthy seem to receive as many or more of the temporal blessings of life as do those who sacrifice and serve. 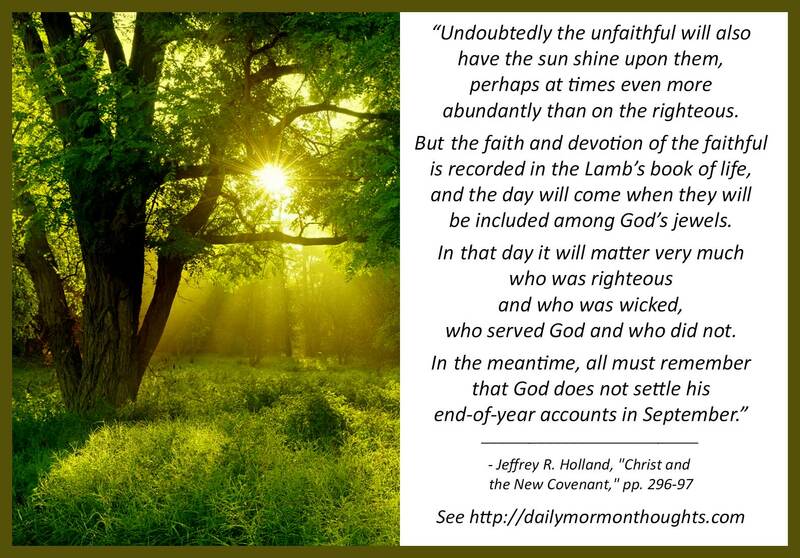 It was to this issue that Christ had just spoken to the Nephites in his Sermon at the Temple when he reminded them that God 'maketh his sun to rise on the evil and on the good' (3 Ne 12:45). The Saints are to be faithful to the end without too many sidelong glances at their neighbors. They are to keep the commandments because they are called to do so and because they need to be kept, regardless of the response of others. Undoubtedly the unfaithful will also have the sun shine upon them, perhaps at times even more abundantly than on the righteous. But the faith and devotion of the faithful is recorded in the Lamb's book of life, and the day will come when they will be included among God's jewels. In that day it will matter very much who was righteous and who was wicked, who served God and who did not. 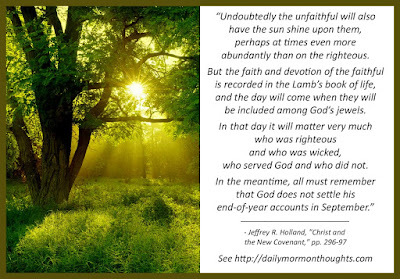 In the meantime, all must remember that God does not settle his end-of-year accounts in September." We sometimes innocently think that the righteous should be abundantly blessed, much more than their unrighteous neighbors. After all, doesn't God promise that when we obey, he "immediately bless" us (Mosiah 2:24) and that when we obtain blessings from God, it is by obedience to His laws (D&C 130:20-21)? For those who have accepted the path of discipleship, these rules apply; we clearly see the blessings that come as we obey, and we know we are in God's hands and He will watch out for us. But God also expects us to learn to live by faith. We don't obey just for temporal blessings, and so temporal blessings don't come just from obedience. We need not worry about day-to-day comparisons of lifestyle or comfort. That's not what the path of discipleship is about; that's not what really matters in life. In the end, it will be very clear to us that God has kept His promises, and when He settles those final accounts with us, all His promises will have been fulfilled.